Inspired by antique horse-drawn cutter sleighs of New England, our Prancer Sleigh glides effortlessly over snow and also makes a beautiful addition to your home decor. 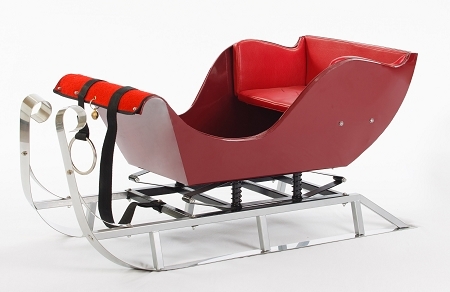 The elegant antique-styled sleigh features high quality steel hull, carpeted flooring, padded bench seat and ringing bells. The sleigh rides on functional leaf-spring/coil suspension and stainless steel skies, with a handle to secure a long pull rope for towing. Recommended for ages 2-5 years old. Adult supervision required. 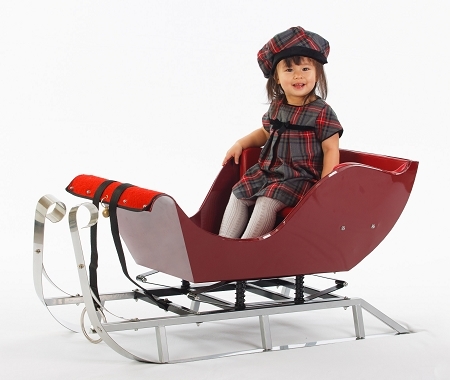 Don't forget our Personalized Prancer Sleigh is the perfect holiday gift! One of the best gifts I could have ever bought our family. It was easy to put together (and I am NO handy man). It looks and feels amazing, excellent quality in material. I pulled my new born son around in the copious amounts of snow we had in 2013. I put his baby carrier right in the sleigh and covered him with blankets and off we went. "Caution when walking down hill!". When he outgrows it, it will be what we put his Christmas presents in for Christmas morning. It looks great next to the Christmas Tree.